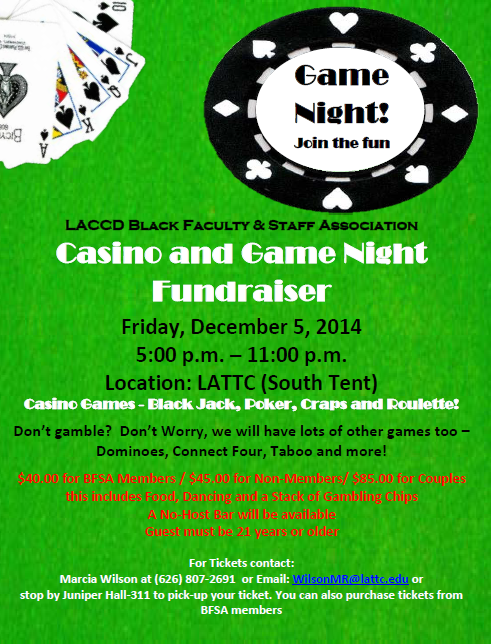 Join the LACCD Black Faculty & Staff Association for its first annual Casino & Game Night! This event is for the entire LA Community Colleges. Please come on Friday, December 5, 2014 at 5:00 p.m. to 11:00 p.m. under the South Tent. There will be Casino games, Black Jack, Poker, Craps, and Roulette. If you don’t gamble, don’t worry! There will be lots of other games too–Dominoes, Connect Four, Taboo, and more!